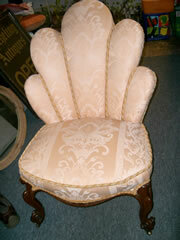 All antique chairs for sale that are currently listed on the Antique Chair Exchange. If you are interested in any of the chairs listed; you will find contact details for each on the full details page for each chair. 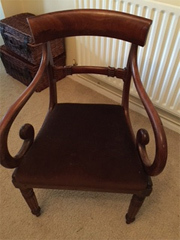 Chairs from a range of antique periods and styles are advertised by individuals and antique dealers, enabling you to complete your sets of antique chairs. 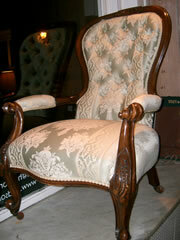 If you would like to advertise your own antique chair for sale, then check out our services page and add your chair. 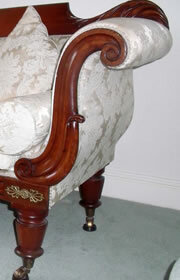 A pair of Edwardian mahogany chairs with Chippendale style carved backs and Queen Anne legs. 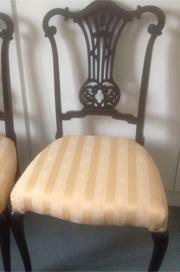 Upholstered in a gold striped fabric. 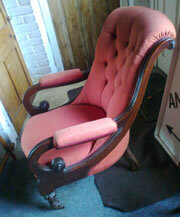 A very nice Victorian mahogany buttoned back armchair with scroll arms and very good melon shaped legs the upholstery is firm so the chair only requires a recover, which can be arranged. 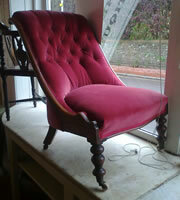 A pretty Victorian buttoned back slipper chair with turned baluster legs. Covered in pink velour. 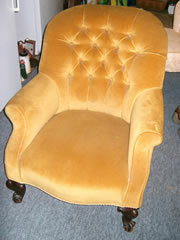 31in high x 23in wide.